One of the challenges of cluster analysis that it appears quite complex and, usually, it needs to be run using special statistical software (such as SPSS). However, using the free template on the above website – students will be able to run cluster analysis simply by entering the data and then viewing the automatic output and graphs. It is a good task to get students working with simple data and seeing how market segments can be formed – obviously students will need access to Excel to undertake this activity – therefore, it could be a good homework task. Please see this page for instructions on how to use the template. Also please see a related activity on this website. 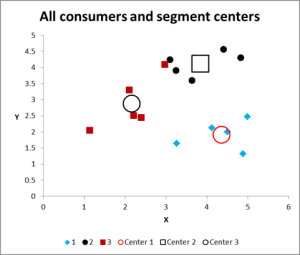 Please visit Cluster Analysis for Marketing (www.clusteranalysis4marketing.com) and download the free Excel template to run cluster analysis. On this website you will also find instructions and video on how to use the template – it is very easy to use and does not require any real spreadsheet skills. Your task to enter some hypothetical (or real if you have it) data for consumers. Enter data for at least ten consumers and at least two marketing variables (please see the list below for ideas on variables). Then review the output – some examples are shown here – for the main graphs and tables automatically produced by the spreadsheet. (Please note that these examples are from different segmentation approaches – that is, they use different data). Get a sense of the various market segments and their “needs” – based upon the marketing variables that you gave chosen to use. How do the variables change the segments? 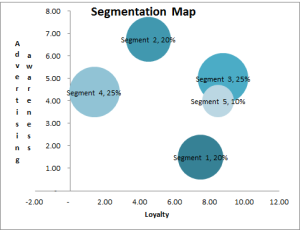 Which types of marketing variables seem to work best – provide more effective segments? Which is your best market segmentation approach from your various “tests”? Why? 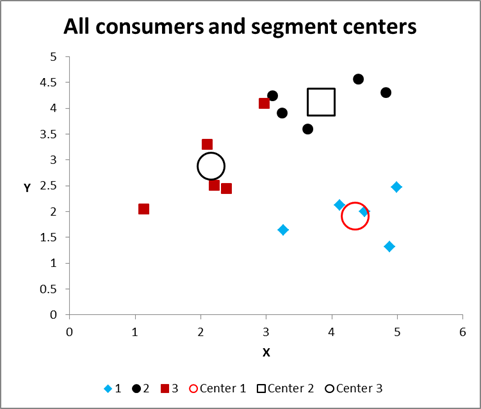 How do you think that cluster analysis works? What do you think are the pros and cons of this type of approach to market segmentation?